The M/V Silver Whisper is considered a small ship in today's cruise market, but its tonnage of 28,258 grt makes it comparable to "midsize" ships like Oceania's Regatta and classic ocean liners such as the Empress of Canada and the Constitution. It just feels smaller than vessels of similar dimensions because it carries fewer passengers in the same amount of space. Its rated capacity of 382 is about half that of comparable ships, and its space-to-passenger ratio is the highest in the cruise industry. The decor and ambience of the Silver Whisper are best described as "elegantly restrained." High-quality materials such as hardwoods and marble are used throughout the ship, but you won't find massive atriums, glittering lights, rococo furnishings, or Las Vegas-style glitz in the Silver Whisper's public spaces. Despite (or perhaps because of ) Silversea's wealthy clientele, the ship conveys a feeling of upper-class comfort rather than conspicuous consumption. 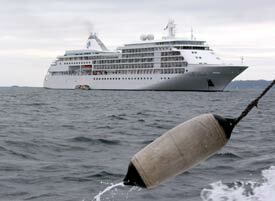 The Silver Whisper had its inaugural cruise in July, 2001 and has been cruising the globe ever since. From spring through early fall, the ship is usually found in the Mediterranean and the Baltic, with occasional cruises to Spitzbergen, Iceland, the Black Sea, and other destinations that tend to be overlooked by the mass-market cruise lines. Nearly every itinerary is different, making the Silver Whisper--and Silversea Cruises--popular with repeat guests.